Back in September I had the privilege of attending one of the seminars of BLEND, which I subsequently wrote about in a post about the event. 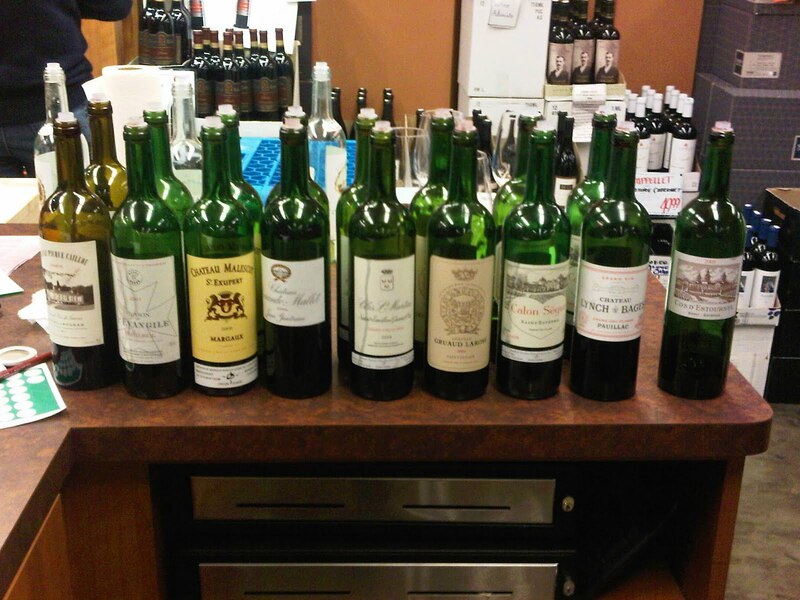 In the seminar, we learned all about the Bordeaux region of France, and how French Bordeaux blends are created. 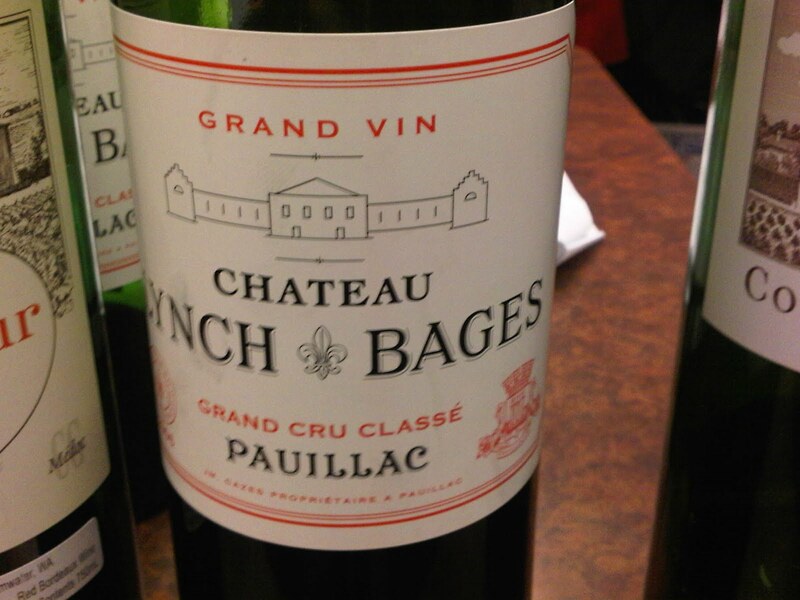 As you’ll recall, the five grapes of the Bordeaux blend are.. (pop quiz, go!) … Cabernet Sauvignon, Malbec, Cabernet Granc, Merlot and Petit Verdot (how did you do?). 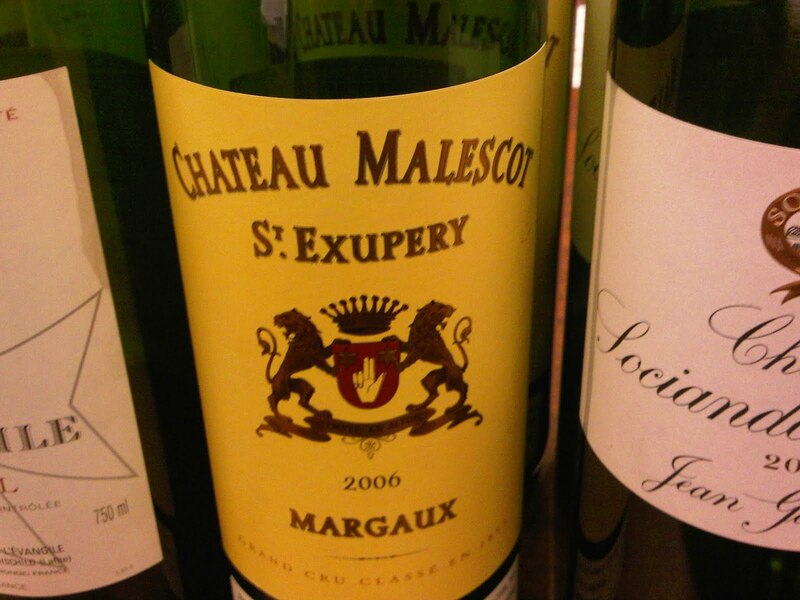 Many Washington wines are made in Bordeaux style and are supremely delicious. So what’s a Washington wine girl to do when the opportunity to taste the REAL DEAL comes about? Take it! Last week I headed down to Esquin Wine Merchants (@Esquin) for a tasting of wines from the Bordeaux region of France. Oh what a treat it was! We tasted through eleven amazing French wines, and I was able to learn so much more about what makes French wine so different from American wine and about all of the different (and historic) practices that go into the making of a true Bordeaux blend. Since I detailed the whole right bank/left bank thing in my BLEND post, we’ll skip straight to the “growths” of Bordeaux. The Wikipedia entry can explain this concept better than I can: “For the 1855 Exposition Universelle de Paris, Emperor Napoleon III requested a classification system for France's best Bordeaux wines which were to be on display for visitors from around the world. 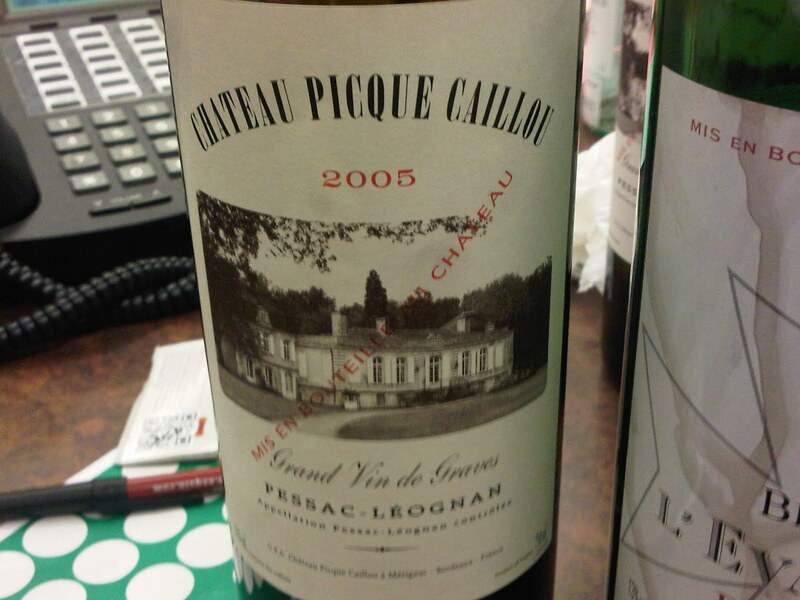 Brokers from the wine industry ranked the wines according to a château's reputation and trading price, which at that time was directly related to quality. 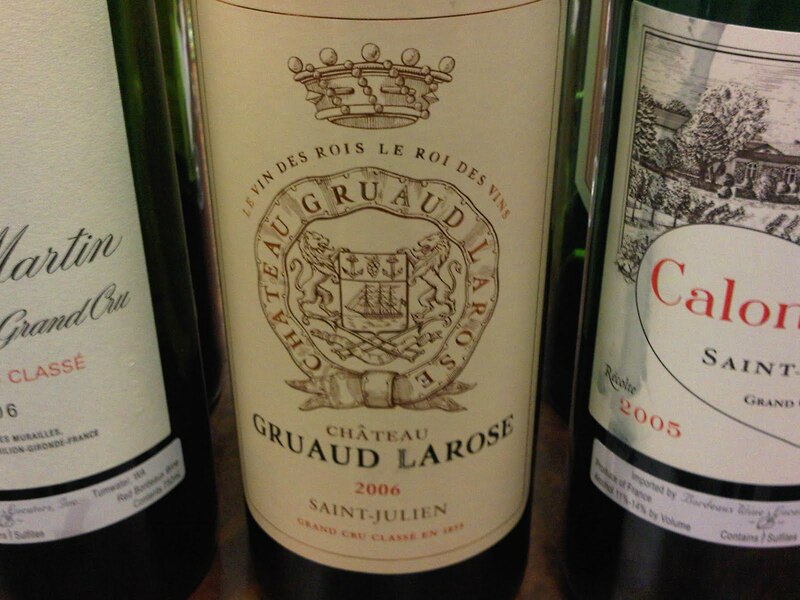 The result was the Bordeaux Wine Official Classification of 1855. The wines were ranked in importance from first to fifth growths” It goes on to say that “within each category, the various châteaux are ranked in order of quality and only twice since the 1855 classification has there been a change, first when in 1856 Cantemerle was added as a fifth growth (having either been originally omitted by oversight or added as an afterthought, depending on which of the conflicting accounts is correct) and, more significantly, in 1973, when Château Mouton Rothschild was elevated from a second growth to a first growth vineyard.” Interesting to note is that the bottles do not specify which particular growth a wine is from. This must be known by the drinker or else researched in advance. It was interesting to learn about the vintages we would be tasting, and how they are perceived by experts. 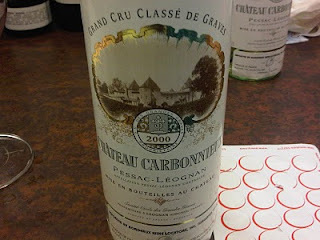 2000 was an amazing vintage, “one of the greats” and probably one of the top 5 or 6 of the past 20-30 years. 2001 was said to be terrific on the right bank. 2005 is considered a great vintage uniformly and 2006 didn’t quite present what it should have and is just in the shadow of 2005. We started our tasting with a 2000 Carbonnieux Blanc, Pessac-Léognan. This 89 point wine from Wine Spectator is a high acid and full bodied wine. It’s so rare that you see a white wine that is recommended to age past 4 years, which is the case with this one. 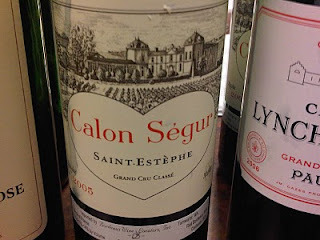 It was the perfect clean wine to begin our exploration of the wines of Bordeaux. We moved on to a 2005 Picque Caillou Rouge, Pessac-Léognan. This wine does not come from one of the classified growths of the region. The wine had a ton of berry on the nose, and a huge burst of tannin on the taste. With each taste the fruit came forward just a bit more, and the finish ended up being quite enjoyable. 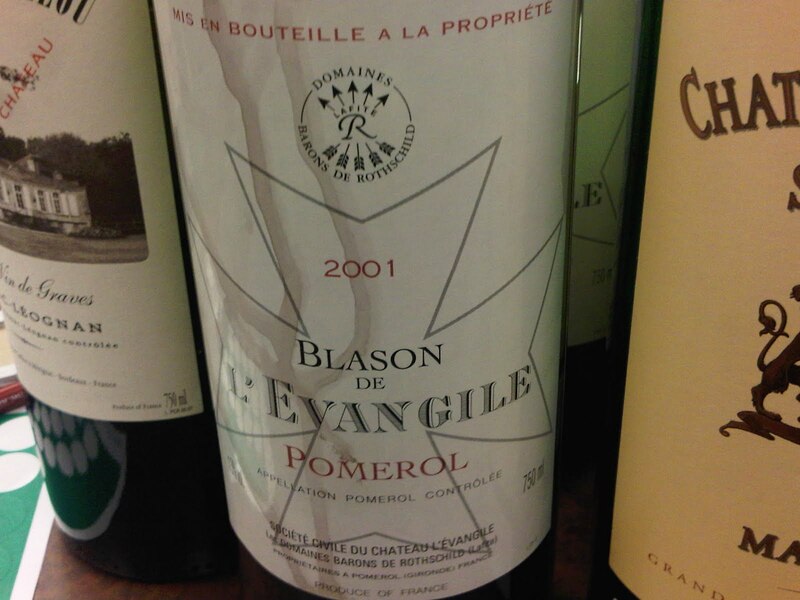 Next, we tried a 2001 Blason l’Evangile, Pomerol. It was interesting to learn that 80% of the Pomerol estate is planted to Merlot. This particular wine is almost all Merlot, with just a hint of Cabernet Franc present. 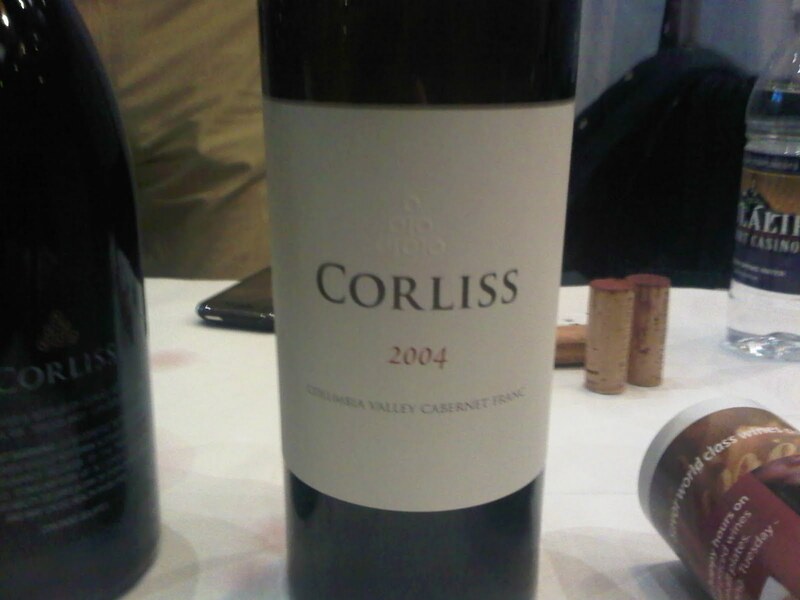 2001 was a great year on the right bank, and this wine will continue to age well. Cherry flavors and another big burst of tannin characterized this wine, which had a deeper and darker color than our previous taste. Next our Bordeaux journey took us to 2006 Malescot St. Exupery, Margaux 3rd Growth. This young left bank wine was a 92-94 point recipient from Parker. The family that owns this estate has had it for just the past 20-30 years. The estate itself is planted to about 57% Cabernet. 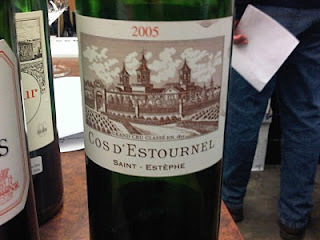 The taste of this wine definitely had that “pucker effect” with the amount of tannins present right off the bat. It also had a very deep and dark color. This wine will age very well, with anticipated maturity between 2010 and 2025. It will become much less tannic over time. 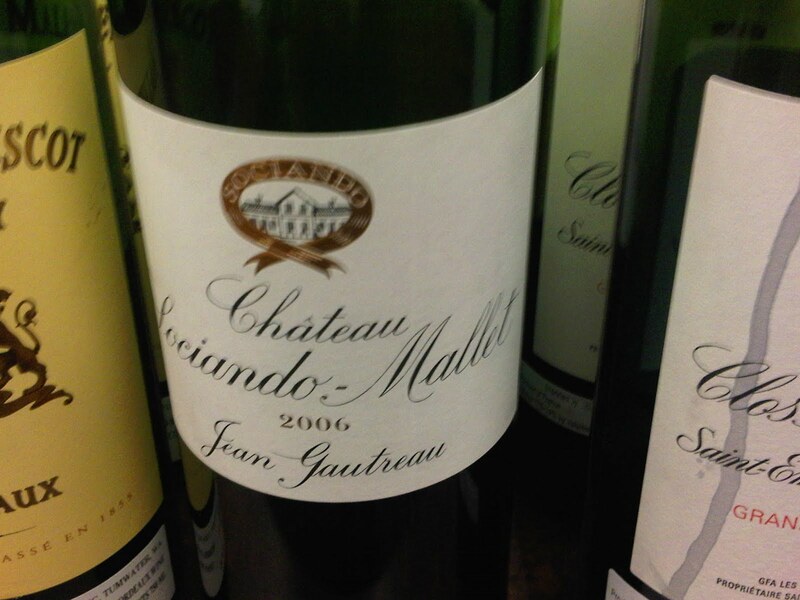 We moved to a 2006 Sociando-Mallet, Haut-Médoc. This was a 90-92 point Parker recipient and had an excellent purple hue. Black current was present at first taste and this was a very Cabernet dominant wine (about 75-80%) which, for now, has those “super tannins” present. This wine will definitely age more and will soften out over time. About 7-10 years of cellaring is recommended, with the wine lasting for up to two decades after that. 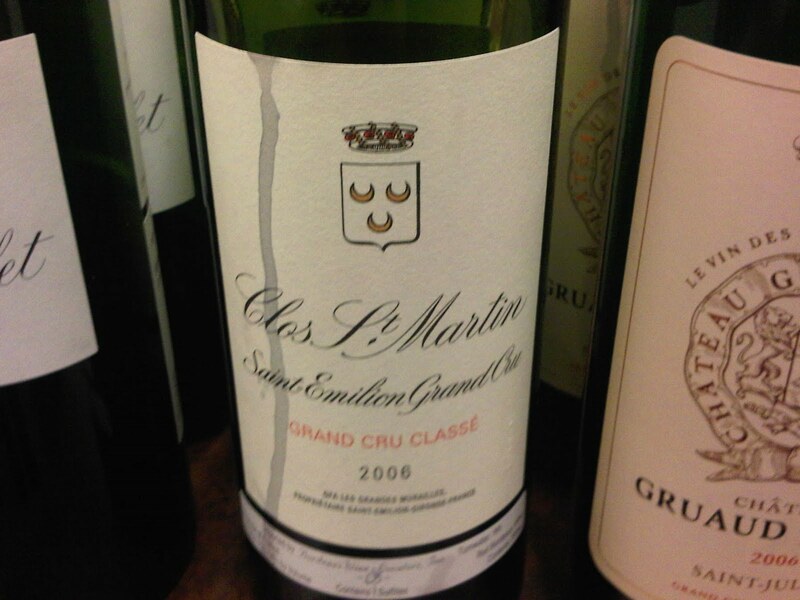 The right bank brought us the 2006 Clos St. Martin, Saint-Emilion Grand Cru Classé. 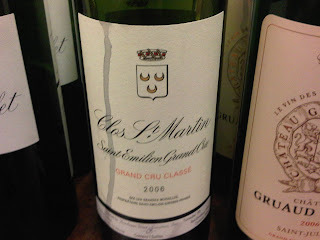 This is one of almost 60 wines that are Grands Cru Classés. There are two estates that are Premiers Grands Crus Classés (A) and another 13 estates that are Premiers Grands Crus Classés (B). 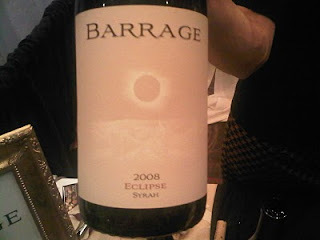 This, another high scoring (92-94 points) Parker wine, had a super smoky nose and was full bodied and quite nice. This is another that will age much longer, reaching its peak between 2015 and 2025. It was no doubt as the bottles became more expensive, my appreciation of them also also increased. We moved forward into the 2006 Gruaud-Larose, Saint-Julien 2nd Growth. This had a slight smoke on the nose, but also had hints of berry as well. The first taste brought a slight attack of those tannins again, but excellent fruity flavors. This wine, best after 2010, was a 90 point recipient from Wine Spectator. I love those wines that one would consider “feel good” wines, which was exactly what we were able to taste next. The 2006 Lynch-Bages, Pauillac 5th Growth comes from an estate that ran into disrepair until it was bought about in 1977. This is a big wine, perfect for lovers of those big bad California Cabernets that need a smooth transition into a love of Bordeaux wines. I enjoyed the nice fruit on the nose of this, and an excellent back of the palate finish. A perfect wine for a cold night by the fire, this fantastic bottle was the recipient of 92 points from Parker. Moving to last of our Bordeaux reds, we had the extreme pleasure of trying the 2005 Cos d’Estournel, Saint-Estèphe 2nd Growth. Of the 14 second growths, this is one of the five that are considered “super seconds”. This is about 78% Cabernet Sauvignon, with a balance of mostly Merlot and just a hint of Cabernet Franc. The wine had an incredible inky dark color and a nose of spice and blackberry. This is a MASSIVE tannin wine with very closed up fruit flavors, but overall it’s very balanced. The flavors will continue to reveal themselves as this wine ages, one that has been called a “wine for the ages”. It’s recommended to not even look at this for about 8-10 years and enjoy it after some serious aging, sometime between 2017 and 2040. This is a 98 point Parker recipient, and I’m tremendously honored to have had the opportunity to try this incredible wine. We finished the tasting with a 2006 Coutet, Sauternes 1st Growth. Very sweet nose with hints of citrus and peach cobbler. Good acidity, and one that will age well for 25 or more years. A little too sweet for my taste, but enjoyable none-the-less. This is another Parker 92 point wine. My journey through the wines of Bordeaux was simply incredible and I can’t believe I had waited this long to enjoy some of the world’s best juice. Each tasting I attend furthers my knowledge of grapes, wine making styles, key vintages, and just an overall understanding of the wines of the world. I’ve been a wide-eyed and eager sponge at these events, taking in all the info I can to broaden my horizons of one of nature’s greatest gifts. I look forward to my next big adventure! 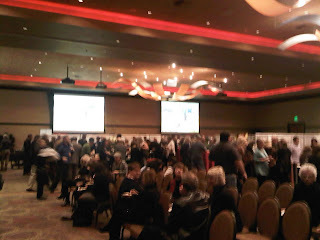 A few weeks ago I provided a preview of the Taste of Tulalip, held November 12th – 13th, 2010. In it I provided a sneak peak on some of the food and wine that would be available at the main event. Well let me tell you something, the main event did NOT disappoint. The whole event was simply fantastic! As we entered, we checked in at the main tables and were provided goody bags and Riedel tasting glasses. The concourse leading to the main Orca Ballroom had all of the California wineries in attendance at the event. 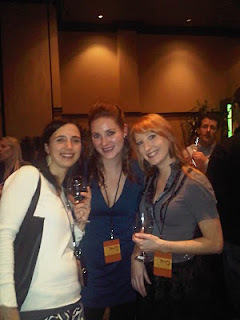 I thought it was interesting, and pretty cool actually, to have the CA and WA wineries separated at the event. That way, while we were in the hallway we knew we were tasting wine from all CA wineries, and in the main ballroom we were tasting WA wines. The main ballroom had the wineries spread out throughout the room, with food prep and tasting stations mixed into center areas. 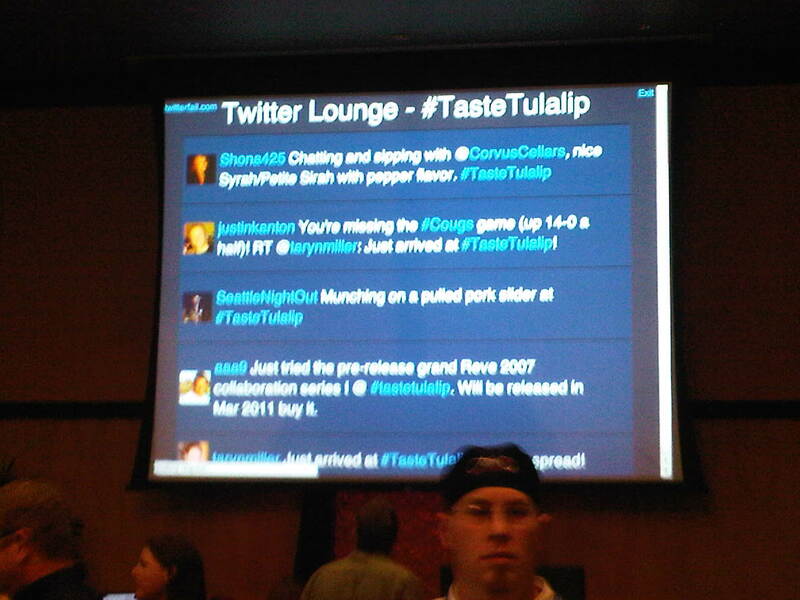 The “twitter lounge” had some couches and chairs, and a large screen showing the tweets of everyone using the #TasteTulalip event hashtag. It was fun to watch my tweets from the event go by throughout the evening! One thing I noticed immediately was the winery placement around the room. At first, I was a bit thrown by the fact that the wineries weren’t in any sort of order. Normally these types of tasting events have them alphabetically arranged and easy to locate. After I wandered around a bit, I realized I liked the random nature of the winery table locations. Instead of bee-lining to specific wineries I knew, it forced me to take a look at each table that I passed, and in turn, I was able to try a few new wines I had never even heard of prior to the event. Several seminars and food & wine pairing challenges also took place during the event, however, I missed those as I never seemed to know when they were happening! (note for next year to event organizers: perhaps an announcement of when these are starting?) Overall though, I was extremely blown away by the wines that were brought to be poured by the wineries, the amazing food offered by the chefs of the Tulalip Resort, and the overall vibe of the entire event. 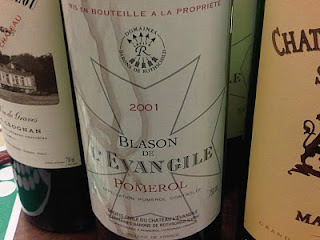 I included a few notable wines from the event below, so read on! Well, go big or go home right? I’m just going to come right out with my favorite wine of the evening, the Corliss Estates 2004 Columbia Valley Cabernet Franc. This wine was balanced and wonderful. I’m finding through my many tastings that I am a huge Cab Franc fan and I think I may have found my favorite of the Cab Francs! This is a must try, and one that will no doubt be finding its way onto my wine rack in the very near future. Additional stand out wines for me were the wines brought by the amazing Bob Betz of Betz Family Winery. I had been hearing all around the wine world that Bob Betz is one of the most genuine and friendly people out there and I was so honored to finally meet the man himself at this event. He took time to explain each wine he was pouring, it was great! 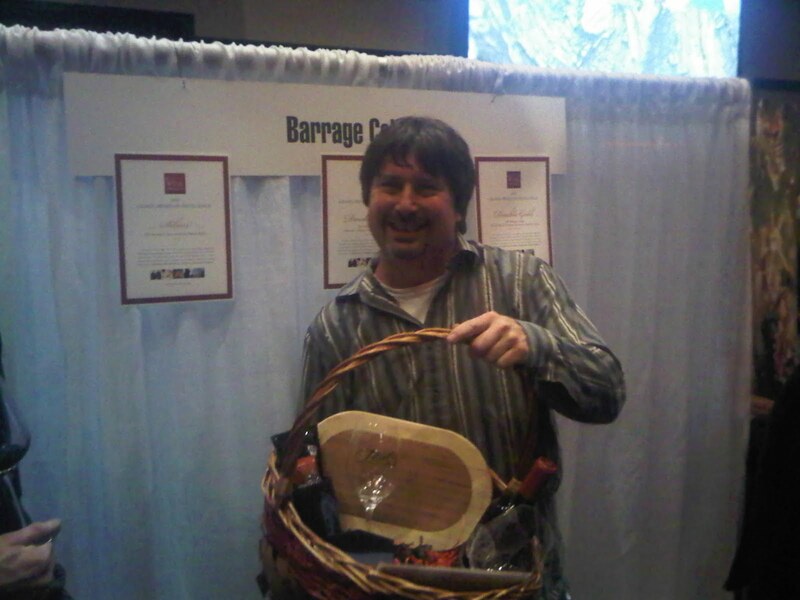 Available at the Taste of Tulalip was his 2008 La Cote Rousse Syrah, the 2008 La Serenne Syrah, and the 2008 Pere de Famille Cabernet Sauvignon. This last Cab I tried is a young cabernet that is amazing now, but will be simply stunning with a few years on it. 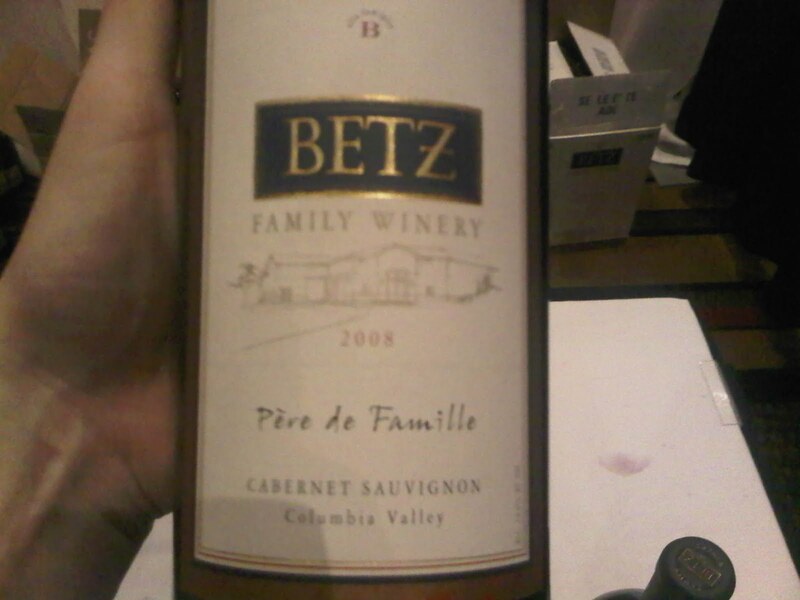 This was my first experience tasting Betz wines, and it will most definitely not be my last. One of the great things about wine tasting events is discovering new wineries and winemakers. 21 Cellars (@21Cellars) is one that I discovered at this event. This winery is based in Tacoma (I don’t think there are many others down there?) and is a partnership between Phillip Coates and brothers Ben and Dan Bradley. 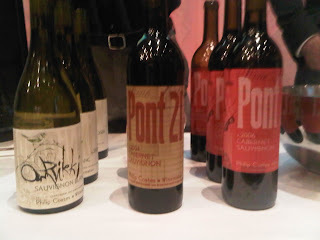 They still have very limited production, with less than 100 cases produced of their 2006 Pont 21 Cabernet Sauvignon, which was poured at this event. The brothers are young and ambitious and I have no doubt that we will see more fabulous wine from them in the coming vintages. Other notable Washington wines from the event: the Five Star Cellars 2007 Cabernet Sauvignon, which received 92 points from Wine Spectator in October, and was a Double Gold at the 2010 Seattle Wine Awards (@WineAwards). A friend and I purchased this bottle to share together at a future dinner, looking forward to it; the Hightower Cellars (@HightowerCellar) 2007 Murray Cuvee Blend; the Flying Trout Wines 2008 Malbec (did you know they are one of Walla Walla’s tiniest wineries for case production? ); and the William Church Winery (@WmChurchWinery) 2007 Sur la Mer French Bordeaux blend and 2008 Malbec, a 100% Malbec. Another standout CA winery was ZD Wines (@ZDWines). Each vintage of their Abacus wine is made with the previous vintages included in it as well. So basically, Abacus XII, which they are on now, contains all eleven prior Abacus vintages in it as well. This is a spendy bottle (the Abacus XIII is pre-selling for $475/bottle), but no doubt is unlike any other wine you will find out there. We were able to try their 2006 Reserve Cabernet at the event, and after the full bodied cabernet nature of that, I would LOVE to try the Abacus someday. So much wine, so little time... While I’d love to have the chance to list out every amazing wine I tried at the Taste of Tulalip, it would just take much too long (goes to show you how many great wines there were there!). If you haven’t tried the wines I did include in this post, get out there and get yourself a bottle and let me know what you think! 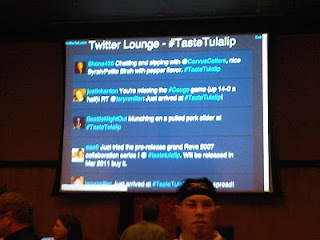 In the mean time, I can’t wait for the Taste of Tulalip 2011, held November 11th and 12th, 2011. This is an event that will become a permanent fixture on my social calendar and I hope to see its popularity increase even more next year! Did you know that 25% of people that drink wine 3+ times per week are between the ages of 21 and 30? Do you realize how much this group of “millennials” is expected to grow within the next five years? The Washington Wine Commission (@WineCommission) does, and celebrate this growing wine market with their annual 20something – The New Vintage (@20somethingwine) wine event. 20something, now in its 5th year, came about when winemakers on the Wine Commission board expressed a desire to have an event catered towards the younger demographic, the 21 – 30ish range. They wanted to make sure this group of young wine drinkers “drinks Washington first” (as opposed to our competition from the Golden State). Madeline Dow, new to the Wine Commission at the time, proposed the idea of 20something as an “approachable” event, and one that had a “fun and lively atmosphere”. In contrast to other major wine events where each winery is featured at their own table, this event has the winemakers walking around in the crowd offering tastings. This approach allows attendees to interact with the winemakers and chat in a more informal setting. This year’s event, held once again at the trendy Fremont Studios, features 75 Washington wineries and more than 15 local chefs offering up tasty bites. As in the past, 20something partners with KEXP DJ Darek Mazzone, who spins tunes to set the mood of the party. Other fun additions to 20something this year include a “Geek Lounge” for those interested in learning a little more about wine at the event. This lounge will include a Riedel (@RiedelUSA) table, where tasters can compare wines in different types of glassware. Doug McCrea of McCrea Cellars will also be offering a Rhone blending area, where attendees have the chance to try their hand at some blending. Also in this area is the “Mer-love” bar, where the young Seattle sommelier team will be on hand to showcase one of the classic grapes that is often neglected: Merlot. This educational area is a great tool for the millennials, many of whom consider themselves wine drinkers, but not necessarily very educated in varietals, blends, or vintages (as most would say about wine: it’s either “red or white”). Another great feature of 20something is that they encourage winemakers to bring their under $30 bottles. This is a fantastic way to market to this demographic that generally doesn’t spend $50+ on bottles like older generations might. A final partnership that 20something brought on this year was a fabulous host. Join the amazing Seattle Wine Gal Barbara Evans (@SeattleWineGal) on the red carpet and for some pretty fantastic prize giveaways throughout the evening! 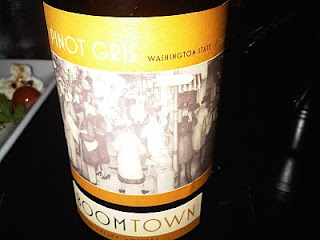 The Washington Wine Commission hosted a small preview tweetup event for several social media people from Seattle at the newest Tom Douglas (@TomDouglasCo) hotspot, Seatown Seabar & Rotisserie (@SeatownROTO). The restaurant graciously welcomed the group into their cozy little restaurant, located just across from Pike Place Market on Western Avenue. Several of the 20something wineries had donated wine for us to preview, and Seatown created a delicious menu of appetizers for us to enjoy during our tasting. Our amazing server made sure we always had food on the table in front of us, and Tommy (nephew of Tom Douglas and also an amazing chef), came out from the kitchen to explain several of the courses prepared throughout the evening. We had 18 wines on hand to preview, and they were all out on the table so we could enjoy them family style, keeping with the casual style that 20something has. 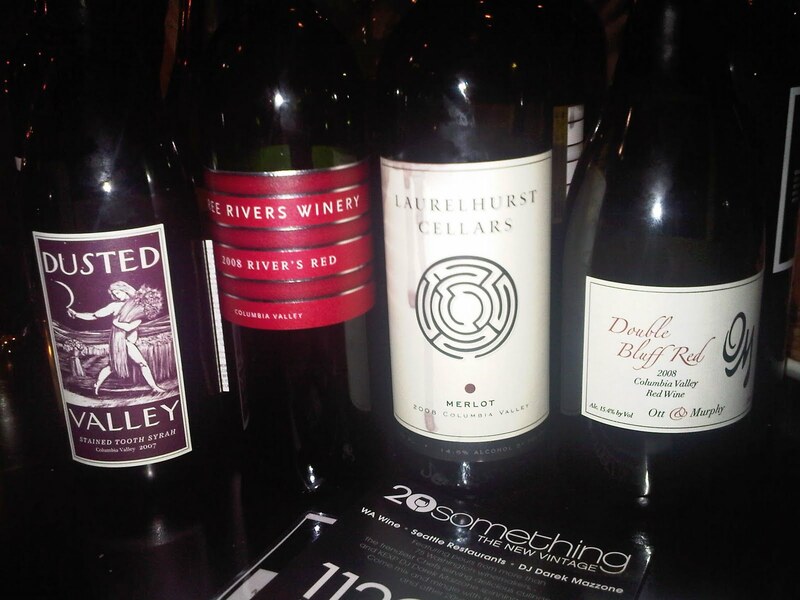 Also in attendance at our preview were two of the 20something wineries: Laurelhurst Cellars (@LaurelhurstWine) from Seattle’s SODO neighborhood, and Ott & Murphy Wines of Whidbey Island. 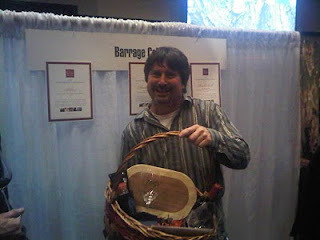 Winemakers Greg Smallwood (who I learned is a WSU alum, GO COUGS!) and Dave Halbgewachs were on hand from Laurelhurst, providing a detailed bio of the winery and winemakers. Did you know that Laurelhurst got their name because that’s the neighborhood where they started their winery in a garage? I love learning those types of fun facts about wineries. Eric Murphy was in attendance from Ott & Murphy, and had tasting notes on hand for the two wines he poured for us at the preview. All the winemakers in attendance were such a pleasure to be around and I look forward to seeing them again at 20something on 11/20! Dusted Valley Vintners (@DustedValley) stood out in both the white and the red category, with my favorite white of the evening being their 2009 Pinot Gris, a Columbia Valley wine and very decently priced at $13 a bottle. Ott & Murphy's 2009 Viognier was also quite good. This Columbia Valley wine was bottled in May and released this past July. It’s 76% viognier, 18% roussanne and 6% chardonnay. Sweet, but enjoyable. Dusted Valley Vintners (@DustedValley) showed well again with their 2007 Stained Tooth Syrah. 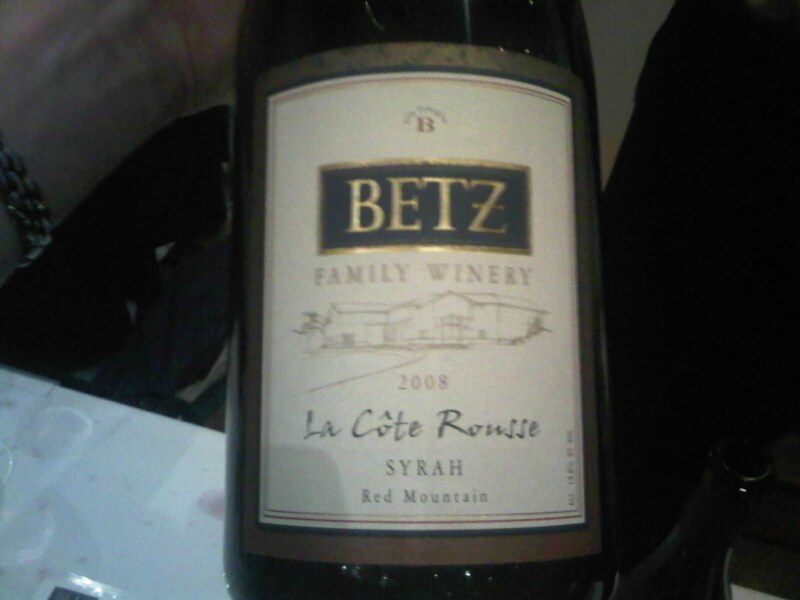 This Columbia Valley wine is just $25 and seemed to be a big hit with many at the table. I think this bottle was finished up first as people kept going back to it for one more taste! A must try at 20something this year! Another standout for me was the Laurelhurst Cellars (@LaurelhurstWine) 2008 Merlot. “Merlot you say? But Taryn, you don’t even like Merlot that much!” True statement. Merlot has never been my go-to wine when I’m browsing my wine rack or choosing my tastings at a winery. Let me tell you a little something about this Merlot: it rocks. Great nose and a fantastic finish. This wine will be part of the “mer-love” bar I mentioned previously. Definitely go check this out! Three Rivers Winery (@3riverswinery) is one that I had not heard of prior to this event. Well I know them now. Their 2008 Rivers Red is a blend of 36% Cabernet Sauvignon, 27% Malbec, 13% Merlot, 11% Tempranillo, 7% Cabernet Franc, and 6% Petit Verdot. This amazing blend is just $14 a bottle! I’m a huge Tempranillo fan, and it was great to see this added into this otherwise common blend. 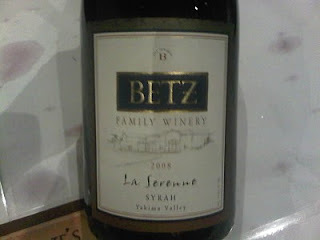 I really enjoyed this multi-grape blend, complex but not overly so. Ott & Murphy stood out again with the 2008 Double Bluff Red Rhone Blend from the Columbia Valley. Excellent flavors, very yummy along with our tasty snacks from Seatown. I was able to snap a few shots of our delicious appetizers before we all dove into them headfirst (well, maybe fork first). 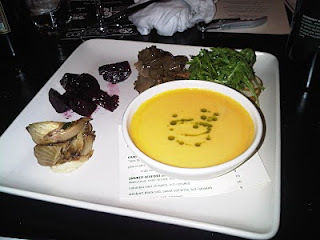 The food at Seatown is wonderful, I look forward to visiting again for a full dinner! 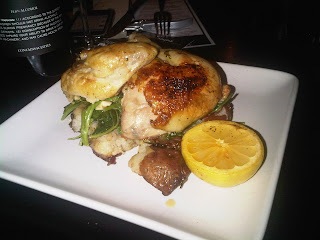 Northwest Free Range Chicken, dripping potatoes, rapini – Great to learn about this dish from Tommy. It’s their “winner winner chicken dinner”! It’s a 3 day process to make this delicious chicken! A must try when you dine at Seatown. 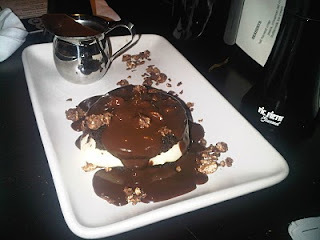 Chocolate deliciousness on a plate (not sure what they call it, but that’s what I’m calling it!). Big thanks to Greg and Dave of Laurelhurst Cellars for adding in some dessert for the tweeters! 20something is coming up on Saturday 11/20/10 from 6pm to 10pm. As of the night of the preview (11/8), only a few hundred tickets remained to this fantastic event. It WILL sell out this week so get your tickets now by clicking here. It’s just $50 for one ticket or two for $90. Come out and mingle with other “millennials”, sip some fantastic wines, listen to some great tunes and learn something in the process. Not in the 21-30 range but still feel like a 20something at heart? You better be there too. This event is not strictly for “20 somethings” only. It’s for all wine lovers who want to enjoy a trendy and different kind of wine event. It’s going to be a blast. I’ll see you there!